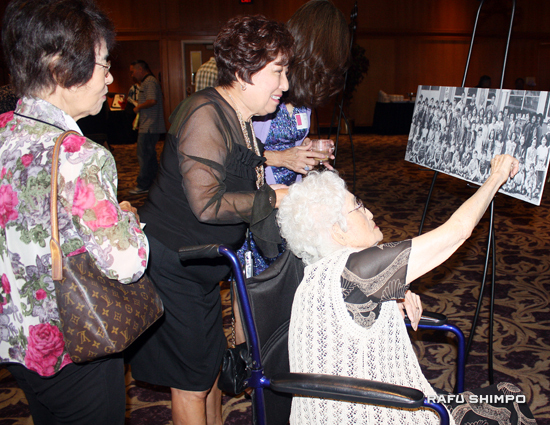 Alumni from the first class of the Long Beach Japanese Language School (LBJLS) gathered for a group portrait at a 65th anniversary celebration held on Sept. 28 in Lakewood. Students from the Class of 1949 are (from right) Walter Shioji, Asako (Kawasaki) Miki, Sadako Kusaba, Ellen Oye Hachiya, Victor Fukuhara, Phyllis Miyagawa, Joyce Miyagawa Oyama, Hiroko Kotsubo Endo, Ruby Matsui Eason, Don Hachiya. 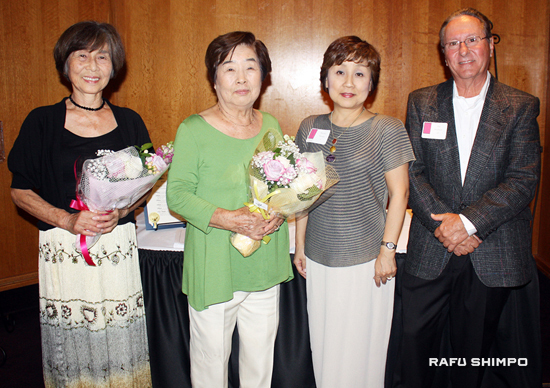 Jay Shaheen, LBJLS executive director, recognized the contributions of teachers (from left) Tazuko Inui, Kazuko Watanabe and Mihoko Tanabe. Masako Kotsubo points to a familiar face as Hiroko Endo looks on.